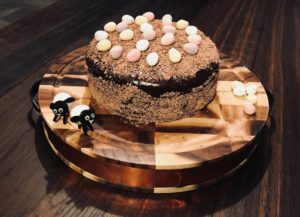 It’s that time of year where we cannot get enough of the chocolatey goodness that Easter brings and what better way to satisfy these cravings than with a perfect chocolate Easter cake. 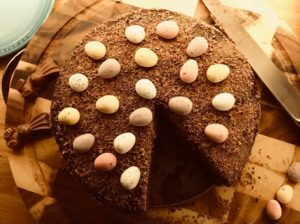 It is a great addition to the Easter feast, for those Easter parties or just as a naughty but oh so tasty treat. Either way, once baked and ready it won’t hang about too long! Now all the ingredients are sorted, the baking can begin…I like to make the ganache first as it needs to cool for roughly 1 hour before it is thick enough to be spread evenly over the cake. Break the chocolate into small chunks and place into the pyrex bowl with the double cream. Place the pyrex bowl into a saucepan filled with hot water so it covers the underside of the bowl. Place the saucepan on a low heat until the chocolate has melted into the cream and is smooth in texture – do not over stir at this stage or the ganache will crack! Stir lightly and then set aside for roughly 1 hour, until it has a thick consistency. Pre-heat the oven to 180C/ 356F/ Gas Mark 4. Grease the 2 sandwich/ cake tins and set these aside. In one of the mixing bowls, sift the Mortons flour, cocoa, baking powder, bicarbonate of soda and a pinch of salt and mix these dry ingredients together. In the other mixing bowl, cream the butter and sugar together until creamy in texture. In the jug, whisk the eggs, vanilla, soured cream and syrup together and then add to the creamed butter and sugar mixture. Mix together thoroughly and add the dry ingredients, continuing to beat together until all ingredients are well combined and create a sticky mixture. Divide the mixture between the two sandwich/ cake tins and bake in the oven for 20-25 minutes or until risen and springy to the touch. Leave to cool in the tins for 5 minutes before transferring these over onto a wire rack and leaving aside. Once the cakes have cooled completely, check the ganache is cool and of a thicker consistency. If ready, spread a third of the ganache over one side of one of the cakes and place the second cake on top creating a sandwich. Then spread the remaining ganache over the top and along the sides of the cake. Grate the dark chocolate and crumble the flake and lightly press into the sides of the cake. Leave a gap at the top around the edges so the shiny ganache can be seen (you’ll want to show off your efforts!) and cover the top of the cake. Dot the mini eggs along the top. If you want to be extra decorative, and because Spring is in the air, place some edible flowers around the base of the cake. Keep an eye out on the Mortons Flour blog for more special Easter treats. Now, go have your cake and eat it! Check out some of our other posts such as #BaketoBasics baking powder vs bicarbonate of soda – which should I use? 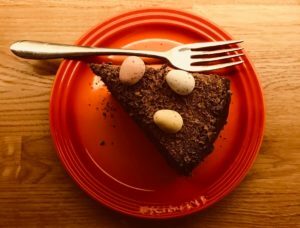 PreviousPrevious post:Perfect Easter Hot Cross CookiesNextNext post:#BaketoBasics baking powder vs bicarbonate of soda – which should I use?